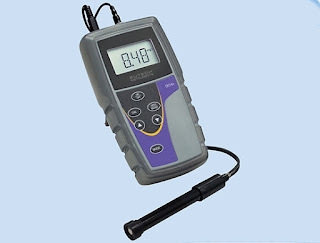 Sell Eutech DO 6+ :: Dissolved Oxygen Meter with 1m cable electrode contact now: +6281283804273, wa : +6281932632003 for order. : : User Customisation for user' s flexibility like toggling of various modes from ppm, mg/ l to % saturation, view electrode diagnosis, etc. - Aquaculture: Use to monitor oxygen levels in catfish and shrimp farming; game stocking ponds; ornamental fish tanks and ponds; and in other fish farming applications. - Industrial: Ideal for checks the quality of plant water intake and discharge, wastewater and water treatment, recirculating systems and industrial process systems. - Environmental: Use to test water quality, monitor health of aquatic ecosystems, survey surface and ground water drinking supplies. - Educational: Ideal for quick, accurate DO readings in laboratories and schools. 1 Refilling Electrolyte (10 ml) & Carrying Kit Set.